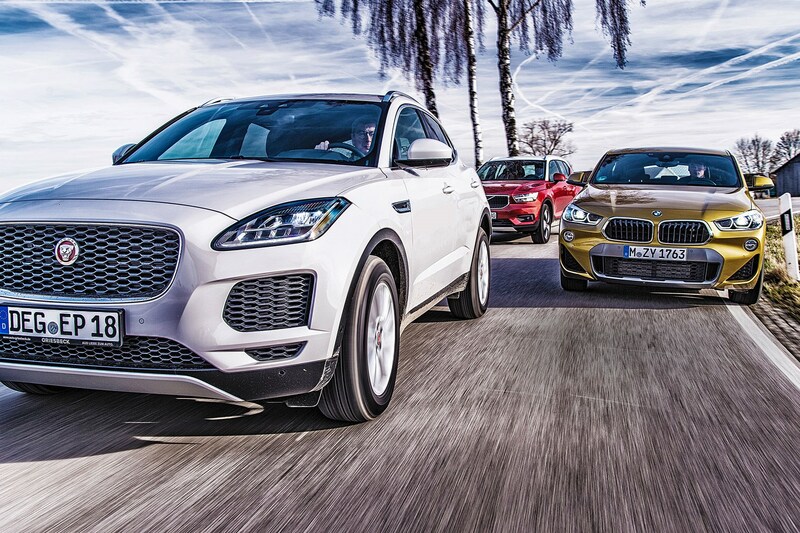 BMW X2 vs Jaguar E-Pace vs Volvo XC40: who makes the best premium baby SUV? ► Which one takes the crown? You know a compact SUV makes a lot of sense. A Hyundai Tucson or a Ford Kuga could drop into your life in the next few hours and immediately set about being really quite useful. But that doesn’t mean you’d actually want one to turn up, does it? The required adjustments are just too much to bear. Zero chance of ever having a memorable drive again? Unthinkable. Turn your back forever on a car capable of a feel-good glow when returned to in a bleak, late-night car park? Ouch. Premium compact SUVs might be proliferating like rabbits in springtime but they can only go on without a shred of enthusiast driver appeal for so long. Jaguar, BMW and Volvo all got the memo – to deliver a small SUV you might actually want to own and drive – at the same time, and interpreted it in broadly similar ways. But there is a clear winner, and two very strong runners-up. The winner of this three-way test is the car that’s the best to drive, but all are big on interior elegance, all-round sophistication and premium appeal. Whichever one you want, you’ll need to dig deep. In each case, the range starts around £30k and extends well into the 40s – and beyond, in the case of the Jag. That’s steep, if compared to non-premium, non-SUV compact cars offering similar performance and space. 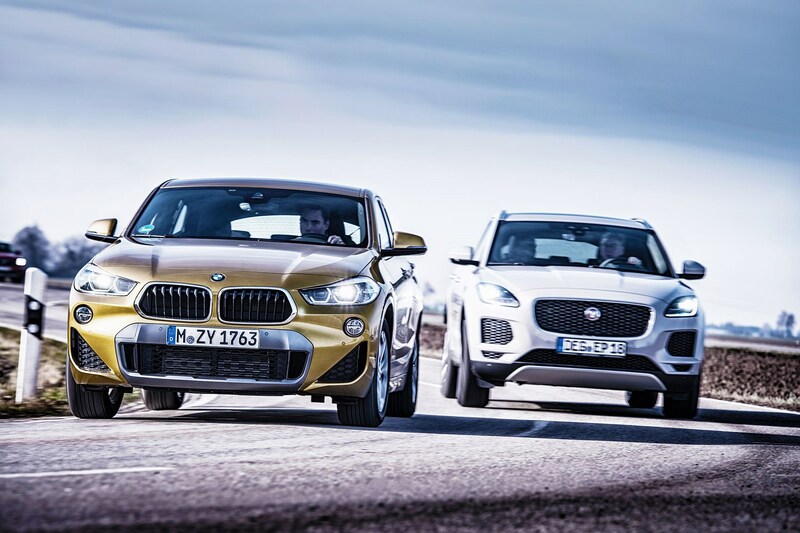 Not so steep if the comparison is with their bigger siblings: BMW X4, Volvo XC60 and Jaguar F-Pace. It’s the same sort of pricing logic that gives us tight-fitting coupes that cost more than spacious four-door saloons. Their shapes blend well with the corresponding brand DNA, their cockpits are stylish and well equipped, their cabins cosseting yet functional. The Volvo is overtly Swedish, with hewn-from-solid looks and some funky details, the E-Pace is the city-slicker equivalent to the slightly more welly-fied Range Rover Evoque, the X2 is a stylish urban guerilla with poise and panache. All are state-of-the-art in terms of safety, all offer a wide range of options and extras, and all assume that the smartphone plays a big part in your life. This is the first BMW X2 CAR has driven. Like today’s rivals, it’s a 2.0-litre turbodiesel four with all-wheel drive and an automatic transmission. It’s the 20d xDrive M Sport version that BMW expects to be the big seller, although ours is also fitted with non-standard wheels and a cosmetic X pack, featuring a neo-off-road body kit of questionable merit. The E-Pace is a D180 AWD Launch Edition, plus a glass sunroof, fancy wheels, power seats and a flashy paint job. The Volvo is the D4 AWD Automatic version, here driven in Momentum trim, although as that’s a specific combination not available in the UK, the prices and stats quoted are for the Inscription. Are we wasting our time focusing on diesels, given the post-Dieselgate sales slump? The manufacturers say not: they’re all sure that these engines suit the cars well and will sell in big numbers. Plenty of other engine and transmissions options are available, with more to follow, including hybrids. And if you’re happy to up-size, the premium SUV will shortly go full EV: Jaguar with the i-Pace later this year, BMW with the iX3 in 2019 and the Polestar 4 in 2020. The BMW and Volvo make identical power and torque figures; the Jaguar makes more torque, and transmits it through a nine-speed auto ’box rather than the eight-speed systems in the X2 and XC40. The figures don’t tell the full story about the Jaguar engine, part of the recently introduced home-brewed Ingenium family that’s been met with a rather patchy reception. There are several minor deficiencies, like a tardiness when it’s asked to pick up revs, a harshness that persists at all revs, and a relatively rough mechanical sound. No, refined this unit is definitely not, but it works well with the long-legged nine-speed automatic, which lets it relax on the open road. The transmission on the Volvo is less impressive than the Jag’s. 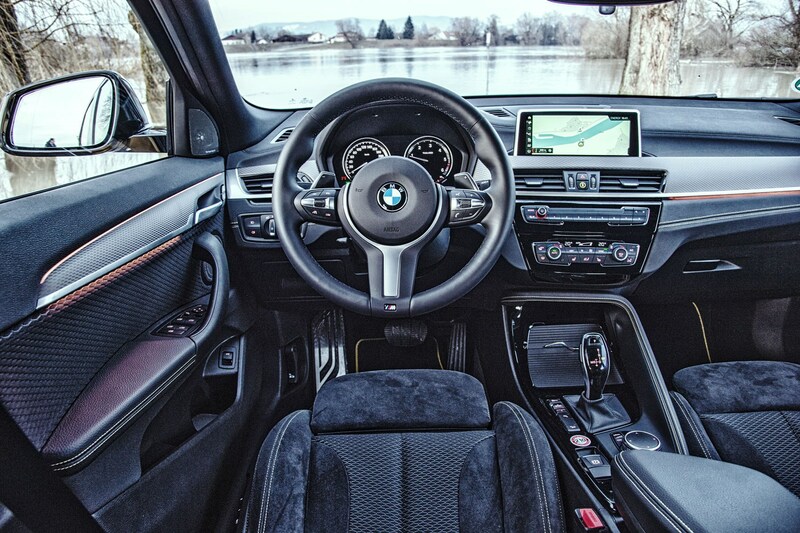 The absence of shift paddles is no big deal, but you have to hit the gearstick twice to set the car in motion, because the Geartronic brain treats neutral as a distinct step that you must deal with, however briefly, rather than simply pass through on your way to engaging drive or reverse. Even more disconcerting are the time-consuming upshifts and the mushy kickdown action. This lazy rubber-band effect makes you think that the Variomatic stepless CVT once used in small Volvos is still haunting the production line. Although selecting Sport mode helps a bit, you all too often feel you’re in a car with engine and transmission not working entirely in harmony. There’s also an irritating degree of mid-range turbo lag when you’re trying to get a move on – something the other two are not entirely free from. The X2, despite being no more powerful than the Volvo, pulls away from both its rivals, with a quicker 0-62mph time (7.7sec, versus 7.9 sec for the Volvo and 9.3sec for the heavier, less powerful E-Pace), a higher top speed (137mph, against 130 for the XC40 and 127mph for the Jag) and a healthier official fuel figure (58.9mpg combined, compared to Volvo’s 55.4 and the E-Pace’s 50.4). To put this in context, Jaguar doesn’t make any claims for the E-Pace being a performance weapon: more grace than pace, it says. Although the X2 20d xDrive is no rocket, it shrugs off its rivals on the motorway with brisk nonchalance, helped by the optional Sports transmission that changes ratios just that little bit quicker and makes a beeline for peak torque. Compared to the competition, the BMW engine boasts a notably broader rev window, which helps to reduce the number of gearchanges. If you choose to floor the throttle, it kicks down without hesitation. For all its superiority over the other diesels, the X2’s engine would also benefit from being more refined; it knocks when cold and gets loud and harsh at higher revs. All three cars are best on slightly slower roads, ideally with little traffic, so you can hold a speed of your choosing rather than be forever accelerating up through the gears. The B8 between Deggendorf in Lower Bavaria and the Czech border proves an enjoyable playground for this trio, with a good number of interesting corners and a wide variety of surfaces. Here, XC40, E-Pace and X2 stay much closer together than on the autobahn. 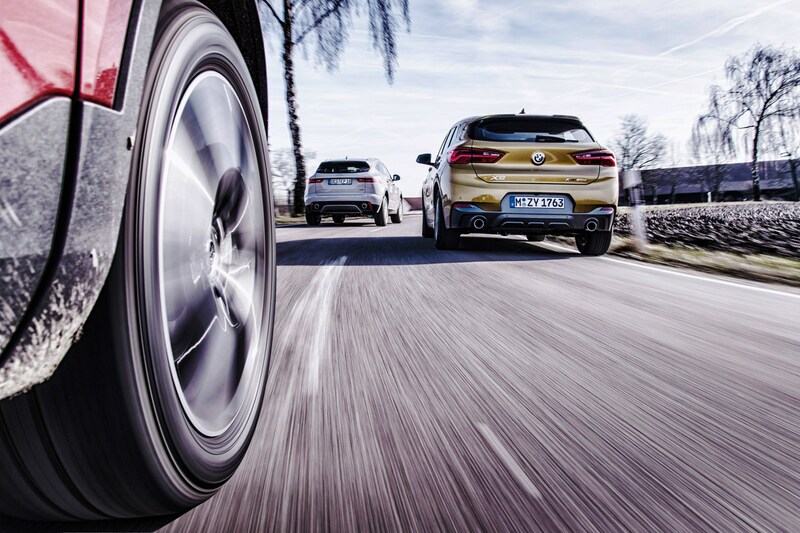 But the BMW is still edging ahead of the others, thanks to its enhanced cornering grip and confidence-inspiring steering feedback all the way to the limit. The sole serious flaw of the X2 is the unsettled ride, which can be downright harsh on broken-up pavement. Even in Comfort mode, the restless and occasionally jiggly M Sport suspension is an issue on all but the smoothest tarmac. Against all the odds, in this particular environment – relatively smooth, flowing backroads – it’s the Jaguar that clinches the honours for finest ride quality. True, the E-Pace hates corrugations and manhole covers, but the spring travel suffices to wade through potholes, the damper action copes well with the wavy stuff, and the entire suspension set-up feels more composed than the chassis of the current Range Rover Evoque we’d brought along as in-house reference vehicle. Even through brake dive and body roll can be an issue when you start letting it all hang out, the car’s lateral, longitudinal and horizontal movements are at peace with each other. The Volvo’s ride is somewhere between the others. The Swede feels more stiffly sprung and tautly damped as well as more stilted and upright than the Brit. The low-speed ride is, however, not too brittle, and longer undulations are taken care of with aplomb. It’s easy to befriend the Volvo’s steering and brakes. Turning the wheel feels a bit more detached than in the BMW but not as artificial as in the E-Pace. Deceleration is an intuitive sequence of early bite followed by plenty of stopping. Through corners it fuses mild understeer with unambiguous response and unflappable stability. While other SUVs clip apexes with more bravado, the XC40 is more4 about a relaxed cornering attitude and reassuring handling balance. Like a lot of Volvos the dynamics border on the anonymous – okay, but shown up by the superiority of the X2. The E-Pace cultivates an edgier attitude, turning-in with extra zest and responding quite aggressively to throttle inputs when in a low gear. It is always eager to brake a little later, then a little later still. Subjectively, it is no faster round bends, but its captivating enthusiasm stirs more emotions, especially in Dynamic mode. Just as you begin to admire the Volvo for its balance and the Jaguar for its ambition, you get back in the BMW and realise that it eclipses its rivals on just about every part of the driving pleasure spectrum. Its steering conveys an extra touch of accuracy, promptness and transparency. Its brakes are relentless energy-squashing pros. Its suspension hits the middle ground between Snow White and Big Bad Wolf. And what about off-road? Not a completely irrelevant question, despite the likelihood that most owners will stick to tarmac whenever possible. Their ruggedness and elevated ground clearance mean you can take these cars up farm tracks and across bomb-hole car parks. They don’t have traditional off-road hardware like transfer cases and mechanical diff locks, but adroitly calibrated ABS, ASR and ESP provide the extra stability, grip and traction to handle snow and sludge. They all, however, come fitted with road tyres, so we’re not making any promises about muddy fields and grassy slopes, where you could easily wheelspin yourself to a standstill. Of considerably more relevance than off-roading is the quality of this trio’s cabins. They’re all good, but the BMW has the most impressive ergonomics, as well as the biggest boot. X2 offers the best range between fills, too. In the midst of the touchscreen frenzy that’s spoiling many other new cars, the X2 retains a version of BMW’s familiar iDrive controller, which provides simple and quick access to every function. 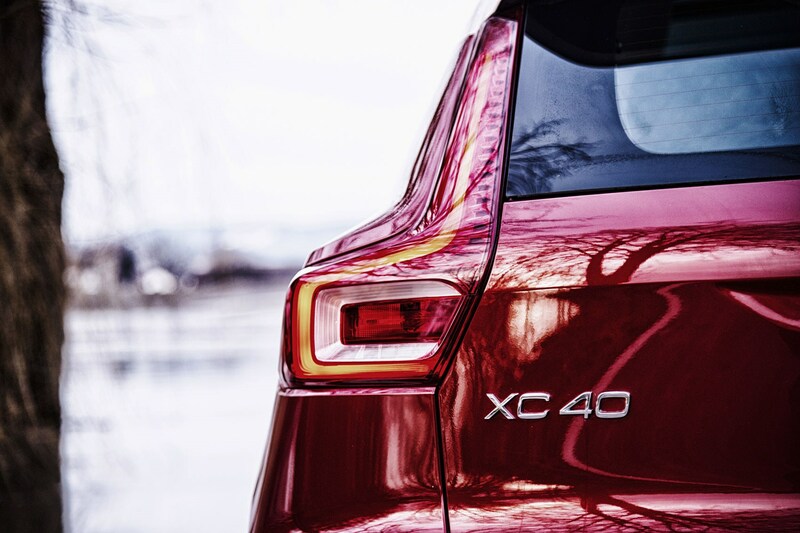 Inspired by the XC90, the XC40 conveys the same contemporary Scandinavian feelgood touch, but here trading in yesterday’s bright birchwood applications for tasteful man-made surfaces, darker colours and that trademark vertical tablet. 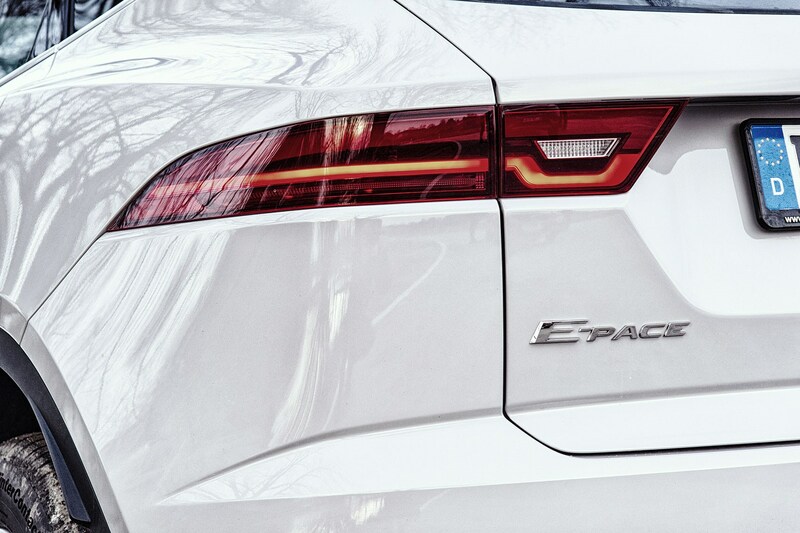 The E-Pace, too, is stylish and sufficiently airy and spacious, but cannot quite match the classy surfaces installed in the BMW. Like the Volvo’s infotainment, Jaguar’s InControl Touch Pro simply isn’t as accessible and talented as iDrive. If you’re thinking SUV is a byword for acres of space, these three are a reminder you can’t have it both ways. They feel wieldy to drive because they’re not big cars – the X2 is the same length as a Ford Focus. Still, it’ll seat four adults, and on the credit side the split benches can be folded forward to accommodate the essential utensils of the upwardly mobile. All the cars are also available with a variety of boot dividers and liners, roof bars and boxes, cycle racks and tow hooks for whichever lifestyle accessories you need to carry. 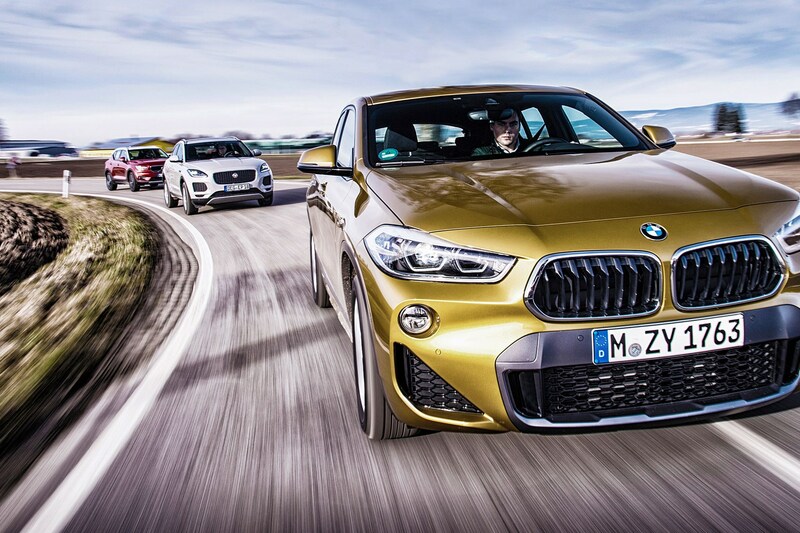 So, the BMW wins – clearly, but with some reservations. In essence, the X2 is a spiffier looking and sportier X1. It is expensive, the ride will be too firm for some, and the fat C-posts impair the rear-quarter vision. But it is more fun to drive than the others, digitally up-to-date and really well made. Of course, most of that praise applies equally to more conventional BMWs, notably the fine 3-series. For the same price as this X2 you could drive an M Sport 320d xDrive Touring. Lose those voguish looks and you’ll make gains: a more natural, encouraging driving machine; a little more boot space; stronger acceleration. A moot point, perhaps – people want what they want, and there is practical merit in the SUV as a road car, notably the improved visibility of a higher driving position and easy child and child seat loading. Last year more than 460,000 UK SUV buyers – nearly a fifth of the market – embraced the high-rise new order, and that’s climbing. If the X2 doesn’t appeal, neither the XC40 nor the E-Pace is a bad choice. In isolation, these two compelling contenders impress with abundant character, flair and ability. They’re both behind the BMW on most measures, but not badly. 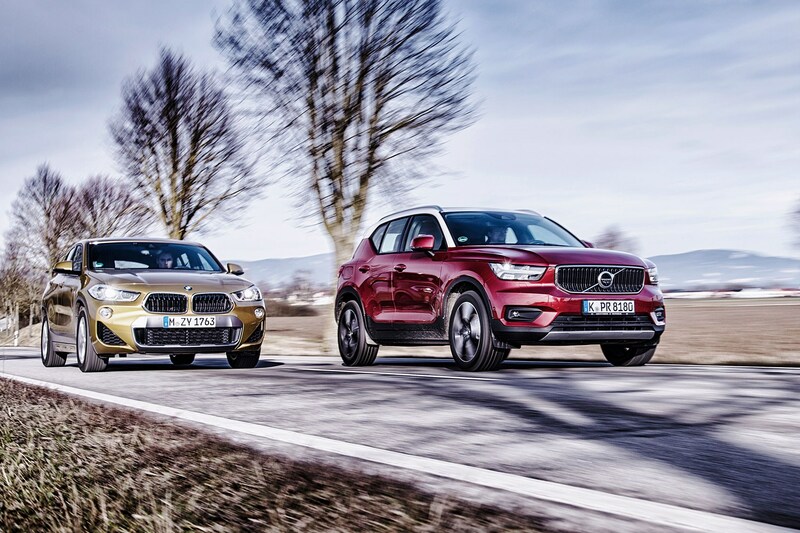 Three cars, three different personalities: the X2 is the driver’s choice, but not in a way that affects its practicality or passenger-friendliness. The XC40 drives well and has a feel-good freshness to it, and the E-Pace comes commendably close to the bigger F-Pace for class… but at a price.